Well, that one was a breeze. Just like I called it. The Pats took care of business against the Jets, 38-3, and are now heading into the postseason as the AFC’s No. 2 seed! Before we get too giddy, you all know I’m here – per usual – to rain on the parade and bring us back down to earth a little bit. That’s not to say that I wasn’t happy with what I saw today; I do think there was a lot to like, especially on defense. BUT the running game didn’t have the greatest showing after their dominant performance last week. Also, the overall offense isn’t as good as a 38-point score might indicate. And I think it’s safe to say Gronk is nothing more than a chain-mover right now, at least for the rest of this season. Again, there were some missed throws – AND let’s not forget the Jets were without their top-three cornerbacks once Buster Skrine was injured – but overall Brady looked pretty solid. Most importantly, though, he looked as healthy as he has in weeks. (Still Shaky on Offense): This offense is not in a great spot. Much like in the early days of Brady’s career, this is a now a complete dink-and-dunk offense that is desperately lacking explosiveness. With Gronk being a shell of his former self and Josh Gordon no longer in the fold, it seems as though the team will again heavily employ the tried and true short-passing, timing-based scheme. I’m not saying it’s entirely ineffective; after all, the team did move the ball pretty well today, converting 45 percent of its third-down opportunities and winning the time of possession battle. But, when you’re down big in the playoffs and need some huge plays, who’s going to provide them? (Welcome Back, Big Fella! ): Why in the world was Danny Shelton a healthy scratch for three games in a row??!! Since he returned last week – after being sat for reasons we still haven’t been told – the team’s run defense has improved exponentially. In the three games Shelton was out, the Pats gave up 7.3, 9.0, and 6.3 yards per carry, respectively; in the two games he’s been back, he’s made three tackles and the team is allowing just 4.2 yards per tote. To be fair, Elijah McGuire, who carried the ball 18 times for the Jets on Sunday, is a backup and certainly no star. But, I don’t know, maybe we should keep big No. 71 in the rotation and give him another shot, huh, Bill? (All-Around A+ Effort from the D): The Pats defense was excellent in this one, at every level. Not only were they able to get pressure on Sam Darnold all game, sacking the rookie four times and forcing some pretty bad throws, but the secondary kept the Jets’ other playmakers at bay, too. Robby Anderson and Chris Herndon, who have both been on fire lately, were held to a total of four catches and 31 yards. OH, and the Jets as a team were also held to just a field goal. Trey Flowers was a beast for the Pats yet again, with a sack and a forced fumble, one of three strips for the Pats on the day. Again, I know it was the Jets, but the D came to play in this one. Congrats to Derek Rivers on his first career sack! Expected to be a big part of the team’s D this year, the 2017 third-round pick has had trouble healing from last year’s injury and staying on the field this year. Hopefully this is the start of something good! Keep your fingers crossed, Pats Nation. 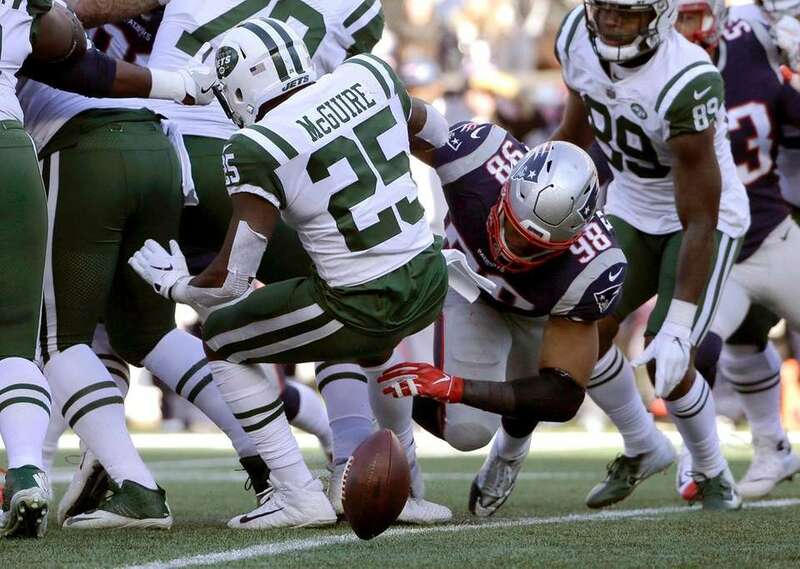 After being without Cordarrelle Patterson on Sunday already, the Pats also saw guys like Devin McCourty, Deatrich Wise, and Dont’a Hightower get banged up against the Jets. We don’t know much about what actually happened to them at this point – besides the fact that it was apparently a head injury for McCourty. Fortunately, the team has two weeks to heal up, but let’s hope none of these are too serious. The team was able to keep the total amount of penalties to a tolerable four for 30 yards. So, while this team is certainly not without its issues heading into the playoffs, their performance in the season finale at least inspires some hope. The team and its group of ailing players now get some extra time to rest before they kick off postseason play on Sunday, January 13 at 1 p.m in Foxborough. Against who, you ask? We won’t know until next Sunday afternoon. Be sure to stay tuned to The 300s throughout the playoffs for all your Pats coverage. Let the “Blitz for Six” commence! This entry was posted in NFL, Patriots and tagged Danny Shelton, New England, New England Patriots, NFL, NFL Playoff Picture, NFL Playoffs, NFL Week 17, NFL Week 17 Recap, Patriots, Patriots Jets, Patriots Jets Postgame, Patriots Jets Week 17, Pats, Pats Jets, Pats Jets Postgame, Tom Brady, Trey Flowers. Bookmark the permalink.